Ralph Burgin in his tomato patch in Carneros. At least twice a week, Ralph Burgin starts his day on the family’s Sonoma Valley farm. Alone with the birds and more than 800 organically grown tomato plants, he picks any heirlooms that have ripened overnight before driving south with the harvest. By the time he arrives in San Francisco, Burgin has traded blue jeans for the tailored formality befitting a general manager of the Cliff House. Chefs in the landmark’s restaurants take over from there, turning all 41 varieties of his farm fresh tomatoes into savory lunch and dinner dishes. 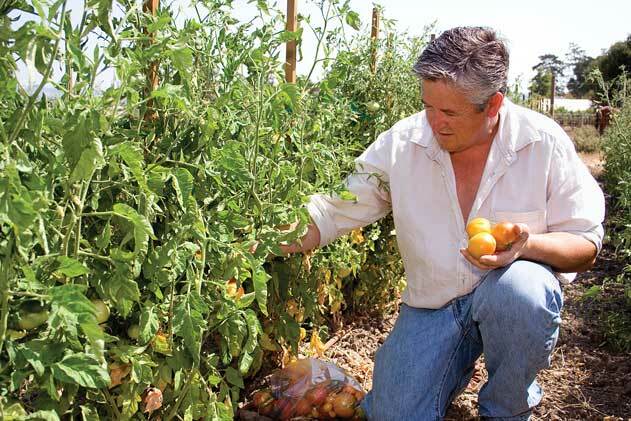 Though Sonoma Valley residents may take for granted their access to farm fresh produce, the rest of the nation is just beginning to appreciate the value of eating locally grown crops and knowing where their food comes from. Burgin planted his first home garden nearly a decade ago so that he could enjoy the flavor of fresh herbs and sweet, vine-ripened tomatoes. Once he ran out of room in his own yard in Novato, he took over the well-fertilized horse paddock at the farm on East Bonness Road owned by his in-laws, Dan and Mary Hountalas. “I started with three rows of tomatoes,” said Burgin, a professional chef in Europe and San Francisco for more than 20 years. “I didn’t know what I was doing, but I harvested a bumper crop.” Once he and his family had eaten their fill, he gave some to friends and took the rest to the Cliff House. Buoyed by that success, Burgin has increased the size of his garden each year until it now covers nearly half the paddock. This year he ordered 41 different kinds of organic heirloom tomato seeds from TomatoFest in Carmel, tucked them into moss pots and kept the seedlings warm until the end of April. When it came time to move the seedlings outdoors, Burgin filled 20 rows with 40 plants each and often spends his mornings stooping between them to search for weeds, watering problems and newly ripened fruit. “I’m out here and the only thing I can hear is the birds,” he said. Burgin chose the varieties carefully to result in early, mid-season and late season crops in a variety of shapes, colors and sizes. If all goes as planned, they will yield enough tomatoes to keep Burgin, his friends and the Cliff House supplied from July to November. These heirlooms benefit from the same Carneros weather — cool foggy nights and warm days — that produce excellent wine grapes in his in-laws’ Hi Vista vineyard. “I grow them with no artificial fertilizers and not much water, so the fruit is a little smaller and the flavor is more concentrated than in most tomatoes,” Burgin said. He allows their natural sugars to develop by leaving them to ripen on the vine, and transports them directly to the kitchen for quick consumption. At Sutro’s restaurant at the Cliff House, Chef de Cuisine Brian O’Connor blends them with watercress, feta and brioche croutons. On Aug. 13, celebrity chef Ron Siegel created a four-course meal around them, featuring Burgin’s tomatoes in soups, compotes and a tarte tatin. At home, Burgin falls back on simple dishes that showcase the fruit’s natural flavor. He makes gazpacho, adds slices to sandwiches and chops them up for tomato salads.